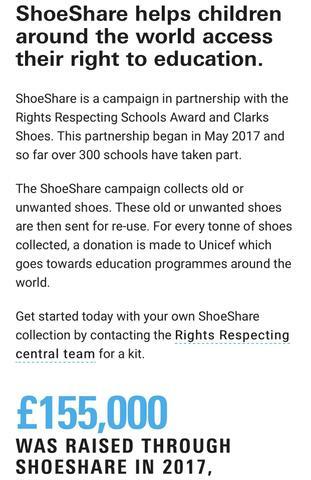 Week beginning 19th November we will be participating in Shoe Share with Clarks and UNICEF. If you have shoes in reasonable condition you no longer want, please ensure they’re clean, rubber band them together and send them to school. We’ll take them to Clarks and they will donate money to UNICEF for every tonne collected. The money raised is used to send children in developing countries to school. Article 28 of the UNCRC says all children have the right to go to school and we hope you can help us achieve this.